Listen to "Gridiron Genius: A Master Class in Winning Championships and Building Dynasties in the NFL" on your iOS and Android device. Former NFL general manager and three-time Super Bowl winner Michael Lombardi reveals what makes football organizations tick at the championship level. From personnel to practice to game-day decisions that win titles, Lombardi shares what he learned working with coaching legends Bill Walsh of the 49ers, Al Davis of the Raiders, and Bill Belichick of the Patriots, among others, during his three decades in football. Why do some NFL franchises dominate year after year while others can never crack the code of success? For 30 years Michael Lombardi had a front-row seat and full access as three titans--Bill Walsh, Al Davis, and Bill Belichick--reinvented the game, turning it into a national obsession while piling up Super Bowl trophies. 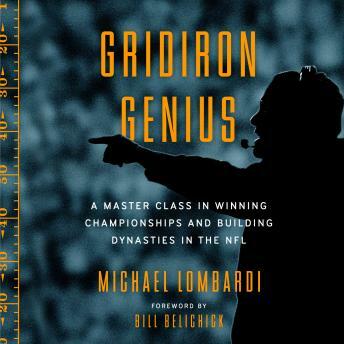 Now, in Gridiron Genius, Lombardi provides the blueprint that makes a successful organization click and win--and the mistakes unsuccessful organizations make that keep them on the losing side time and again. In reality, very few coaches understand the philosophies, attention to detail, and massive commitment that defined NFL juggernauts like the 49ers and the Patriots. The best organizations are not just employing players, they are building something bigger. Gridiron Genius will explain how the best leaders evaluate, acquire, and utilize personnel in ways other professional minds, football and otherwise, won't even contemplate. How do you know when to trade a player? How do you create a positive atmosphere when everyone is out to maximize his own paycheck? And why is the tight end like the knight on a chessboard? To some, game planning consists only of designing an attack for the next opponent. But Lombardi explains how the smartest leaders script everything: from an afternoon's special-teams practice to a season's playoff run to a decade-long organizational blueprint. Readers will delight in the Lombardi tour of an NFL weekend, including what really goes on during the game on and off the field and inside the headset. First stop: Belichick's Saturday night staff meeting, where he announces how the game will go the next day. Spoiler alert: He always nails it. Football dynasties are built through massive attention to detail and unwavering commitment. From how to build a team, to how to watch a game, to understanding the essential qualities of great leaders, Gridiron Genius gives football fans the knowledge to be the smartest person in the room every Sunday.